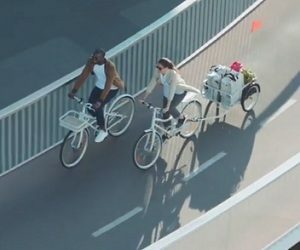 Ikea USA has released a new commercial, introducing SLADDA, the perfect bike for uban mobility. The 60-second spot features the city bike launched by the Swedish home-furnishing retailer, as well as some of its easy to attach accessories for transporting large or small cargo, such as the front rack, which can be purchased at a price starting from $34.99, the trailer, available at a starting price of $259.00, and the SLADDA helmet, available at a starting price of $39.99. This unisex bike, whose name means “to skid sideways” in Swedish and comes in flat-pack form, is made in partnership with Veryday. Available in one colour (gray) and two sizes (26″ and 28″), Sladda can be purchased at Ikea’s website at a starting price of $599.00. The track used in the commercial is “Some Kinda Miracle” by Oliver Price & Roscoe Williamson.